This Autumn, let’s have a toast to all the untold narratives of the world! This issue is special to us for manifold reasons. One, being voracious fiction-readers ourselves, we have always been drawn towards its politics. What does it even mean to talk about politics in fiction, of fiction? Is it just what we write about? Or, is it also about how we write it? Isn’t it also about the politics of the form? Doesn’t the form also have a content, the content a form? These are the questions we have asked ourselves incessantly, as we have worked towards the inevitable collation and curation that accompanies every journal issue. But, whatever it is, this work of understanding the fiction in all its aesthetic and political complexities, cannot happen without the essential work of celebrating the very work of creating literature, the very acts of making space for that literature find its public space. In our own very small way, we have tried to do that work. What is being written by today’s fiction writers? Watching this issue taking a concrete shape for last few months has been an experience so precious and so personal that it is difficult to find an expression in words! Let us thank all our contributors all over again here. It is a handbook on the recent changes in Indian Labour Laws: What exactly are these changes? What effect will they have on workers’ rights? Why are the workers all over the country on strike? Subhendhu Dasgupta discusses all these questions and many others and reflects on the possible responses to this attack. Please send us an email or contact us at +91 9830411525 if you would like to get a copy (Rs. 15/-)! Three, with this issue we walk into the third year of our little existence! We would love to hear from you! Follow us on Facebook, Twitter, or drop us a line at aainanagar@gmail.com. Manasa R. – Poems By Manasa R.
A special note of thanks to all the illustrators and photographers who have worked on the stories in this issue. 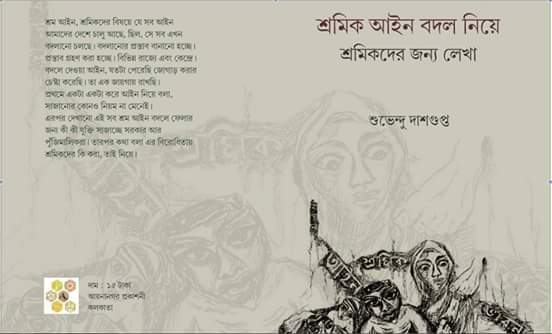 Thanks to Gautam Chakraborty for composing some of the pieces for this issue. As always, we express our gratitude to Pramod Gupta and Soumyajit Pramanick for innumerable things that we cannot keep track of.